Crystal & Martin's gorgeous floral tablescape with a jasmine garland. With all of the holiday parties, company dinners, and festive receptions this past month, we've seen decor of all types and styles. Some groups go the traditional route, with red and green tablescapes, soft lighting to accent the room, and plenty of Christmas tunes. Others choose silver and gold decor throughout the venue, keeping the theme sleek and shimmery. Whatever your design preference, a table garland is reliably delightful. But why save garland just for the chilly months? Natural garland is here to stay! Our favorite garlands are lush and green, accented with bright flowers, candles, or even small party favors for the guests to take home. Garland allows you to skip the vases and water (or adds to it!) and let the foliage artfully spill onto the table. Know the table length. If you are trying to achieve a more formal look, make sure your garland is within a couple inches of the table length. If you are trying to achieve a more organic and artful look, add an extra foot to hang off either side of the table (assuming no one is sitting at the ends). Know your budget. Garland is typically priced by the foot and range in price depending on complexity and lushness. If you're working on a budget, don't be afraid to get a basic arrangement and add in some flowers yourself! Know your table settings. If you think the chargers, wine glasses, and other items on the table will take up a lot of room, adjust the fullness of your garland accordingly, or consider table vases instead. 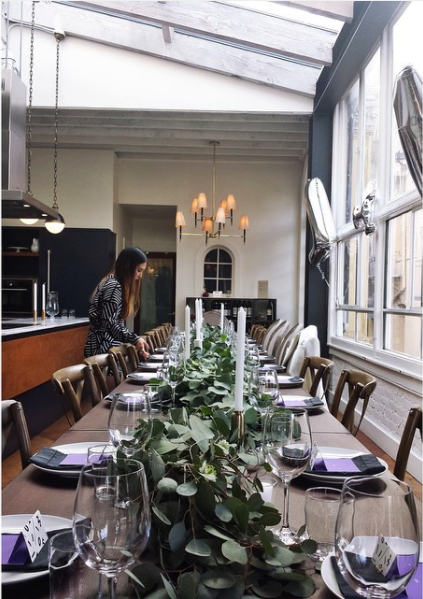 Whether it be a memorable baby shower, formal birthday party, or breathtaking wedding, share your garland pics with us on Instagram @cookhousesf. Happy planning!